A truck traveling at high speeds with heavy or dangerous cargo could result in a tragic and devastating highway accident. Trucking accidents may be catastrophic even at low speeds. 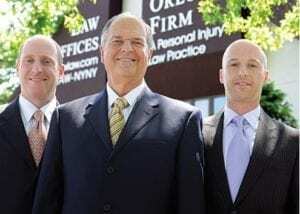 At The Orlow Firm, we are experienced in representing the victims and families of trucking accidents. Catastrophic and deadly trucking accidents require the skills of an attorney who can tackle complex litigation and drive your case towards a successful resolution. We work to see you restored after suffering serious injuries. Accidents involving commercial vehicles and trucks can lead to complex litigation involving businesses, insurance companies, multiple defendants, and federal trucking regulations. If you have been injured in a trucking accident, you want to be certain that your attorney is adept in handling the complexities of trucking litigation. Our team of Brooklyn trucking accident attorneys will work to obtain optimal results in your case. Large loads, dangerous products, and other dangerous conditions can lead to catastrophic and fatal accidents involving semis and other large commercial vehicles. If you have been injured in a trucking accident, it is imperative that you contact a Brooklyn trucking accident lawyer as soon as possible. Our attorneys will immediately begin work on your case to ensure that necessary evidence, including witness statements, black box recording evidence, and driver’s log records are preserved. We will work to protect your financial security and your interests now and into the future. Free consultation: If you have recently suffered an injury or wonder if you have a legal claim, our qualified and experienced lawyers will offer a confidential and honest assessment of your case. Contact our office by calling (646) 647-3398 today. We will come to you if you cannot come to us.